It was a day to celebrate the Class of 2018, and to applaud their hard work and congratulate the newly minted graduates on their hard-earned accomplishment. 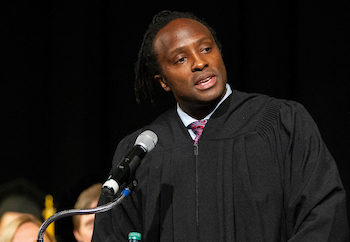 “You make us laugh, you teach us new things every year, and you inspire us with your energy, your dedication to justice, your many, many talents, and your community spirit,” said Dean Erika Chamberlain, speaking at the Western Law awards ceremony held on June 20. “Graduates – this is a time for you to reflect on everything you have accomplished, and all the hard work you have put in to get here. You have received an excellent legal education – now you need to put it into practice as lawyers and, more importantly, as professionals,” she said. 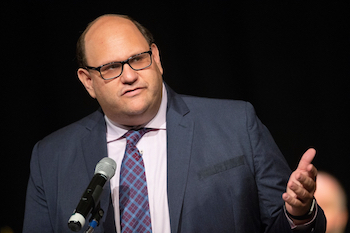 Michael Rubinoff LLB’01 delivered an inspiring keynote address (video below) and told the grad that realizing their dreams is possible. He encouraged them to embrace and learn from failures. Rubinoff, the Producing Artistic Director, Canadian Music Project at Sheridan College, developed the Tony-winning musical, Come From Away. He told the grads it was his dream to tell the story of the outpouring of humanity by the people of Gander, Newfoundland following the dark days of 9/11. Rubinoff encouraged the grads to speak out against injustice, to raise up the most vulnerable, and to make Canada better for everyone. “You have the power to make a difference for so many. We all have an important role and it starts with speaking up,” he said. Erin Rankin Nash LLB’08 a member of the Western Law Alumni Association, told the Class of 2018 the importance of keeping alive the connections they made at Western Law. In his valedictory address (video below), Mark McAuley JD'18 said the Class of 2018 forged strong bonds in their three years together. and noted the class participated in the research-a-thon against the Trump travel ban and the Law Needs Feminism Because initiative. “As lawyers we will not simply be readers of rules, we will be working in a changing and evolving society… Today your already impressive resumes have been enhanced by a law degree that empowers you to be an agent of that change,” he said. Some of the honoured guests who joined in the awards ceremony were: Tony and Betsy Little, who presented the Arthur T Little Scholarship and Gold Medal to the top graduating student Will Fawcett; Joshua Lerner JD’17, who presented the Hon. Mayer Lerner QC Award to Dylan Dilks; Dr. Kevin Flynn, and his son Kevin Flynn presented the Ailbe C. Flynn LLB’97 Memorial Scholarship to David Chapman; and the Lorenzo Di Cecco Memorial Award in Criminal Law was presented to Danielle D’Alonzo by Bill and Anna Maria Braithwaite, Raf Di Cecco, and Alessia Goulding.